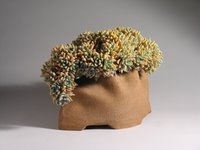 These stoneware planters with the black background represent recent work, available at local venues and my home studio. The yard in Spring. Solar electric panels upper left. Round rocks from El Salvador beach. Solar electric panels on garage roof. These three wall planters are made from stoneware clay with a paper clay veneer which is scored, stretched, fired, stained, and fired again to 2170 degrees. See contact information at bottom of page. Shown on these pages are some examples of my stoneware planters, designed and created to be both a work of art as well as a functional container which enhances and complements the plant it contains. My planters are often seen in succulent, orchid, and other horticultural shows where the plants they contain often win ribbons, including best in show or category.